It may be the graphics on that vinyl wraps, leaving you endearing to it. It may be the range of color shades that would have made you prefer them over a custom paint job. Or it may be because you feel they are far trendier; your eventual decision is that you need to have a vehicle wrap instead of a custom paint to give your sporty sedan a new look. But, I don’t really know how much a vehicle wrap costs? A vehicle wrap needed to cover a Chevy Sonic would be of a different size in relative to the wrap that would be covering a Chevrolet Colorado. Difference in material requirements and hence difference in the cost that is incurred. 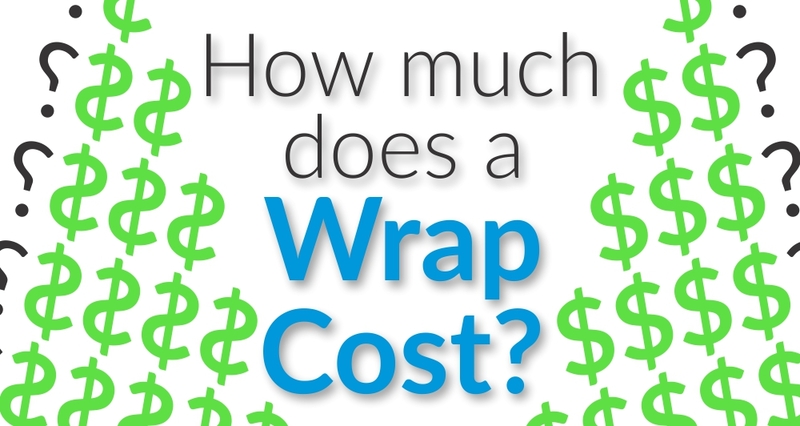 Similarly, it would cost more to wrap a damaged vehicle than what it would take to wrap a car in good condition. These factors are variable and only a proper inspection can determine the actual cost that will be incurred during the process. Full wrap allows you to cover your entire vehicle except the engine bay. A partial wrap on the other hand will be covering certain sections of your vehicle and not the entire car. This could just be the hood, trunk or side panels. Since the application varies, so do the material needed in each case. The cost of vehicle wrap in this case would entirely depend on the application of it, just like in our previous discussion. Vehicle wraps come in different vinyl wrap films, each having its own unique characteristics. Carbon Fiber: Costing $9-11 per sqft, carbon fiber includes matte or brushed metal finishes. Chrome film: its cost varies depending on the color and purchase store, but you can get stylish chrome color change starting from around $16.85 per sqft. Gloss films: they are much shinier than their counterparts and can be purchased at a starting price of $9.00 sqft. Another factor which decides the cost of your vehicle wrap is the graphic that will be printed on it. Many customers choose to print an already existing graphic. However, others would like installers to custom create a graphic as per their requirements. As this involves custom designing, a service provider will charge depending on the complexity of graphic to be designed. If you want a vehicle wrap to replace your paint, it may cost around $2000 to $6000. If the vehicle wrap is to serve the purpose of advertising it may cost between $250 to $4000. Finally, it’s the expertise and reputation of the installer that would decide the cost of your vehicle wrap. At UpDog Wraps, our installers are the best in So Cal and are 3M Certified. Vehicle wraps are great and in fact, improved alternatives to custom paint jobs. They provide us with flexibility of choices, lower maintenance cost and approximately same durability as a high quality custom paint. Vehicle wraps combine options with affordability. Get a FREE Custom Quote Today! Our prices will not be beat, guaranteed!